The first title for Paris? Paris St. Germain might have won the French league with 2 games in hand and with a bitter aftertaste after monday’s events. However, they were not the first Parisian team to win the French league. This award goes to one of the forerunners of PSG: Racing Club Paris. This is one of the oldest clubs in France, dating back to 1882 when students of the Lycee Concordet started practicing long distance running near Saint Lazare station. Soon they moved to the Bois de Boulogne. As with many clubs in France they catered for many sports and Racing Club were no different and today there are a golf section, tennis, Judo, water-ski, shooting and bridge. The football and rugby are separate entities under the roof of the name Racing Club. The rugby section plays under the name Racing Metro 92 in the French Top 14, the first division of French division. The football team find themselves in the 5th division of the French football pyramid, the Championnat de France Amateur 2. Established in 1899, the football club was one of the most successful in France. The first league title came after only 8 years of the club’s existence in 1907 after being runners up in 1902 and 1903. 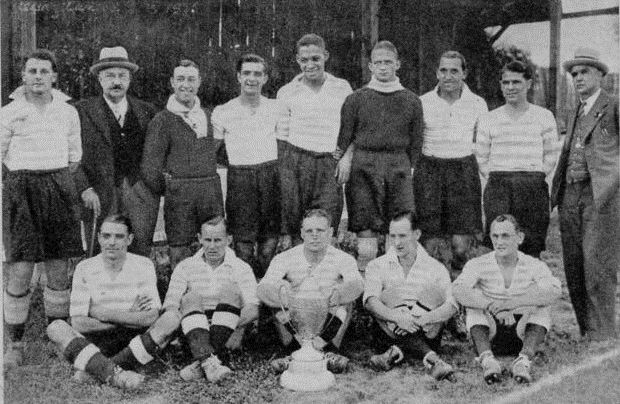 However, with the introduction of the professional league in the early 1930s, Racing Club hit its most successful streak, winning the double in the 1935/36 season. During that period they were coached by an English man, Gabriel Sibley ‘Sid’ Kimpton, also known as George Kimpton. He was one of those English coaches with an insatiable wanderlust. Between 1921 and 1950 he mainly coached in Europe, commencing with DFC Prague, Polonia Warsaw, Cracovia and Le Havre. His only coaching station in England was Coventry City in 1928. The dates of this career stage are somewhat unclear but he re-appeared in 1934 to coach France for the World Cup in Italy. Luck was not with them as they lost under dubious circumstances against the Austrian Wunderteam, 3-2 after extra time. Staying in Paris, Kimpton gave tactical lessons around the city before he took up the managing post at RC Paris, where he introduced the WM Formation. By sheer conincidence, this led to RC’s most successful period, winning the double within a year of Kimpton’s arrival as well as the Cup in 1936. George Kimpton is the only manager to have achieved the double with a Parisian club, a record that now stands for almost 80 years. Up to this day, the club have won 5 French Cups, which is just behind Olympique Marseille with 10, Paris St. Germain on 7, AS St. Etienne with 6 and have been runners-up on 3 occasions in 1930, 1950 and 1990. They came close to win the league in 1961 again but AS Monaco won the title with 57 points, ahead of RC Paris on 56 points. A year later, the goal difference tipped the league in favour of Stade Reims, another traditional club in France. It was as tight as it could get. Both clubs finished on 48 points, which must be considered a very low margin to win the league by. Further, both had a goal difference of plus 23 goals each, which meant that Stade Reims had won the title just by having beaten RC Paris. Not surprisingly, the club has brought forward a number of great players. From a German perspective it is certainly a surprise to find Pierre Littbarski among the former players. He stayed a year from 1986 until 1987, playing 34 games, scoring 4 goals before returning to Cologne. The highest profile of French players has David Ginola who wore the sky blue and white shirt between 1988 and 1990. However, the most curious is the name of Enzo Francescoli, a Uruguyan of Italian origin. He played for River Plate, an Argentinian institution in football but came to RC Paris in 1986 where he stayed 3 years before moving on to l’OM where he won the Ligue 1 trophy in 1990. The football history of Paris is a diverse one, having seen clubs fold and go under and re-emerge again. RC Paris is one of the oldest clubs in town and one of the most successful. With the arrival of the Qatari owners of PSG, this is expected to change in the not too distant future. However, RC Paris hold the honour of winning the double and remain so far the only club having done so in Paris.